Hasbunallaahu wa ni amal-wakeel. Allah is sufficient for us and the best of those on whom to depend. If only i could say that the Umrah trip is my Heart then I could humbly say that The Yunnan Qurban trip will be my BLOOD. Both these journey are my LIFELINE, beating & flowing still in my body. Both remain as good memories. Once again, with Allah's Blessing, embarking on the Yunnan Qurban/Aqiqah trip had indeed carve a milestone on Silaturrahim, Iman & Ibadah too ! Sister Mariah Mah have liven up to her promises in providing a fruitful Qurban/Aqiqah experience for all participating bros & sisters who had come on this journey. My spouse & I have never regretted coming on this trip & we encourages all to embark on this wonderful & memorable journey too! A valuable lesson in life. Friendship were built instantly & bonds getting stronger as bros & sisters getting to know each other more as day passes on. Everyone remains in contact with each other since coming home, good soul mate too ! Beautiful memories & stories were told, retold & retold to family & friends back home. One cannot fathom how blissful & lucky one is till one experience it personally. 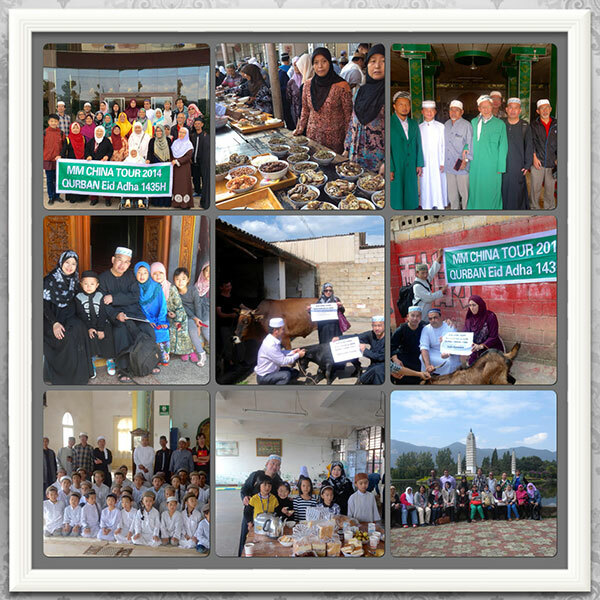 A wonderful experience visiting Kunming's islamic Madrasahs & Mosques. The exhilarating events, visits, tours & encounters are the plus point of the entire trip. Unesco National Heritage Site - Stone Forest & Jiu Xiang tour with its beautiful sceneries & monuments are an eye opener, a "not to be missed" destination. All meals & lodgings meet our expectations too ! Masya Allah Meeting the little Hafiz, listening to their recitation, witnessing the Qurban rituals right in front of your eyes, getting to know the Muslim bros sisters of Kunming, dialogues & interaction with them are wonderful opportunities in life, not to be missed. Woke up early on Idul Adha, did the Fajr prayer in my hotel room & got emotional missing family & friends back home, cried a lot too! Silaturrahim spirit were strongly felt especially in the Mosque where the Qurban rituals were carried out. Everyone including the children were busy helping out on this memorable day. This kind of spiritness is unique, genuine & hardly be felt anywhere else in my Muslim life. As such I can truly say that this is my first experience, even though its my 2nd Qurban. I love Islam. My religion. Witnessing the poor sanitations,living conditions,clothing,food, education & schools, we hope we can contribute and do more to help these poor & deprived. You can help too, by embarking on this educational and beneficial tours, especially with your children. Staycation, Europe Trip, Paris, Italy, Sweden & branded leather accessories etc can wait. Our Islamic bros & sisters in these poor country need your help. Pre School & Mosques are very much needed for them. Do waqaf a little for a good cause. May Allah increase your rezeki. The faces in these pics tells the story of a wonderful & satisfying trip.